The purpose of this research is to compare the effects of different shoes on knee osteoarthritis symptoms. Knee osteoarthritis is a major problem in Australia and there is no cure for the disease. Non-drug strategies that help people to self-manage the condition are needed. Different types of shoes influence forces acting across the knee joint. We know that increased knee forces can contribute to the knee pain associated with knee osteoarthritis, and that high forces can increase the risk of the disease worsening over time. It is recommended that clinicians provide advice on “appropriate” footwear for people with knee osteoarthritis. However, there is little evidence from clinical trials to determine which shoes are best for self-managing knee osteoarthritis. We are conducting a research study to compare two classes of readily available off-the-shelf shoes on knee osteoarthritis symptoms. To do this, we will allocate people via a random process into two different groups. Participants in each group will be provided with 2 pairs of different shoes to wear daily for 6 months. To ensure that this is a fair and unbiased evaluation, we will not disclose the differences in the shoe classes between the two groups until the end of the study. There will be an equal number of participants in each group, and participants will not be able to choose which group they are in. The findings of this study will help determine which shoes are best for people with knee osteoarthritis and will guide clinicians in providing appropriate evidence-based footwear advice for their patients. The findings of this study will be published in medical journals and be presented at conferences. currently have knee pain on most days. What will you have to do? The study involves two screening steps to confirm your suitability: (1) telephone screening (which you may have already completed) and (2) x-ray screening. If you pass screening, you will be invited to take part in this 6 month study. If you decide to take part, you will be asked to sign the Consent Form (either on paper or online). You will then be allocated to receive one of two classes of footwear. This type of study is known as a “randomised trial”. To ensure the two groups in the study are similar to start with, a computer allocates each study participant into a group randomly, like the flip of a coin. Neither the researchers nor the study participant can decide which treatment the participant receives. As there are two shoe classes being compared in this study, you have equal possibility (a one in two chance) of receiving shoes from either class. We are most interested in knowing the longer-term effects of the footwear on your knee pain and function so we would like to ask you to commit to the research until your 6 month follow-up measures are completed. It is very important from the research that information is collected at 6 months so that we can analyse your data as part of the project. 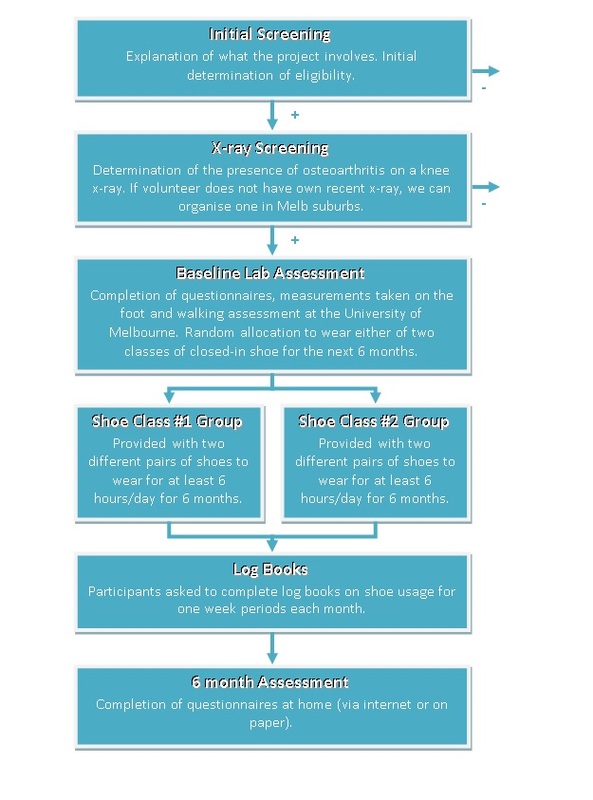 If you have not had x-rays of your knee in the past 12 months, you will firstly be asked to attend a participating radiology centre for a knee x-ray to determine if you are eligible for the study. These centres are located at Bridge Road Imaging in Richmond, Blackburn South Radiology and Brunswick Diagnostic Imaging. You may attend the centre that is most convenient to you. The x-ray will take around 15 minutes and involves a small amount of radiation. There is no cost to you for this x-ray. If you have a suitable x-ray of your knee taken within the past 12 months, the researchers will send you a stamped addressed envelope to send the x-rays in to the University for assessment. Once this has been done the researchers will send the x-rays back to you. We will call you when we have the x-ray results. If the x-ray shows you have moderate to severe knee osteoarthritis predominantly on the inside of your knee you will be eligible to take part in the study. If you are deemed suitable to take part, you will then attend the University of Melbourne, Department of Physiotherapy Human Movement Laboratory to undergo the baseline assessment, which will take approximately 75 minutes. It will involve completing a set of questionnaires which ask about your personal details, knee pain and function, your medications usage, previous knee treatments, physical activity levels and quality of life. One of the researchers will also perform some assessments of the posture and mobility of your feet while you stand barefoot in a normal stance. The researchers will ask you to bring with you to the University appointment your 3 most commonly worn pairs of shoes. The shoes will be assessed for style and structural characteristics. You may take your shoes home with you afterwards. You will then be randomly allocated to receive shoes from one of two shoe classes using a computer program. You have a 50% chance of being allocated to either group. You will chose two pairs from a selection of 3 different styles of shoes (such as shoes appropriate for athletic, casual or dress wear). You should choose a combination of shoes that you believe you will be able to wear for at least 6 hours per day for the following 6 months. It does not matter if you wear one pair more than the other. All shoes are readily available off-the-shelf shoes, rather than medical/orthotic shoes designed specifically for medical conditions. To ensure that this is a fair and unbiased evaluation, we will not disclose the differences in the shoe classes between the two groups until the end of the study. We would prefer you to avoid starting any treatments for your knee pain if possible during the study. However you continue to take any regular medications you may be using. If you do undergo new treatments or begin taking new medication, you will have the opportunity to report these to the researchers in the questionnaire at the 6 month mark. Following shoe allocation and fitting, you will be asked to perform a walking assessment in your own shoes. The walking assessment will involve putting some thin insoles inside the shoes that have pressure sensors inside them, which are attached to a belt worn around the waist. You will be asked to perform 6 walks of an 8 metre walkway at your usual pace. Over the 6 months, you will be asked to complete a short log book for one week each month. In the log book you will indicate how many hours you wore the study shoes for each day of that week. The log books will be provided with a stamped addressed envelope to return them in the mail. Six months after being given your study shoes, you will be sent a follow-up questionnaire to complete at home (either online or on paper where we will provide a stamped addressed envelope). These questionnaires will be the same as those completed at baseline about level of knee pain and symptoms, medications usage, physical activity levels, quality of life. You will also answer questions about any adverse effects you experienced, and answer questions about the study shoes such as about comfort and likeability. Following the completion of the entire study, participants will be contacted by email or mail to inform them of the class of shoes they were provided, and information about the specific hypotheses the study was testing, as well as the main study findings. No findings that could identify you will be published. All data and results will be handled in a strictly confidential manner. This project is subject to the requirements of the Human Research Ethics Committee of the University of Melbourne (HREC No. 1748784.1). If you would like to participate in this project, or to find out more details, please click NEXT to submit your details and we will contact you as soon as we can. Or you can phone Penny Campbell on (03) 9035 5702. Prof Rana Hinman is a research physiotherapist who has conducted 20 randomised controlled trials in musculoskeletal conditions, most in knee osteoarthritis. She is the Chief Investigator of this trial. Prof Kim Bennell is a research physiotherapist and Director of the Centre for Health, Exercise and Sports Medicine (CHESM). Dr Kade Paterson is a podiatrist and musculoskeletal researcher at the Department of Physiotherapy at the University of Melbourne. Mr Tim Wrigley is a biomechanist and technologist whose career has been based on research and development for human movement analysis, in academia and with industry. Mrs Penny Campbell is a Research Scientist, who will take on the role of Trial Co-ordinator. This will include participant recruitment, administration of questionnaires and scheduling of participant appointments. Dr Jessica Kasza is a biostatistician from the Department of Epidemiology and Preventative Medicine at Monash University. Prof Andrew Forbes is a biostatistician from the Department of Epidemiology and Preventative Medicine at Monash University. Mr Ben Metcalf is a Research Scientist, who will help develop the study protocol and study documents. He will also collect laboratory baseline data, randomize participants to shoe group and fit allocated shoes.